Our Incumbent Prime Minister Manmohan Singh feels that he can beat the Inflation with Cost-Cutting . May be he had a wild dream of ever rising Inflation last nite and immediatly gave a call for Austerity. Pity, our UPA Govt works more on assumption rather on clear cut planning. 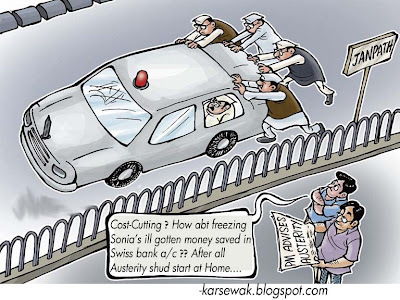 Now cost-cutting is on top of the priorties of Manmohan's Govt. But who cares.....even after a desperate SoS call from PM himself, many of Central ministers left for foreign trips . Such is the status of our dummy PM . I wonder to what extent these small measures of putting brakes on foreign trips , cutting over-head expences of ministries etc will help to over come crisis . I feel arresting Political and Burecratic corruption , bringing out ill-gotten black money of Industrialist will for sure make a diiference at this time of fuel crisis and inflation . This will boost confidence of common man and install sort of discipline among citizens . How about starting this campaign from 10 janpath Soorpanaka-Sonia Gandhi residence by making her surrender her ill-gotten money of Bofors deal and the bribes she took from Russia's secret agency KGB . The Water that the Italian 2 bit Barmaid drinks is brought everyday from France's Mineral Water sites, PAID by INDIAN TAXPAYERS.